Justin and Ethan are both playing baseball this year. Justin is a Mite, and Ethan is a Pre-Mite. They were so excited to get their ball uniforms this week! Justin's uniform is brand-spanking new. Ethan's is the same one Justin wore last year. (Not the exact shirt, which we were hoping for.) 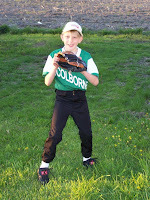 Justin's first game was Tuesday night against Crediton - and they won 20-3! 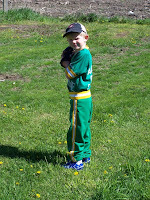 He had a base hit both times he was at bat, and he was able to score one run. He also played Shortstop, First Base, and Right field. He did a great job! Ethan's first game is next Monday, and he's really excited. So far, he's had two practices, and really enjoys it. Ah, the joys of summer! The boys look spiffy in their new uniforms! Anyway, the other team had lots of subs, which meant they were fresh. But win or lose, Critter had a blast. So, it's all good.